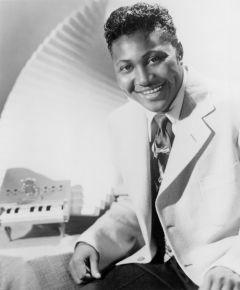 The most well-rounded talent of rock’s first half dozen years, Amos Milburn combined a soulful voice with exceptional songwriting skills and impressive chops on the piano to become one of the brightest stars in the early rock universe. The Texas born Milburn showed an early inclination towards rocking with a handful of cuts as a teenager which pre-dated rock ‘n’ roll’s official birth but gave notice there was a new style poised to emerge. Signed to Aladdin Records in Los Angeles he was paired with A&R man Maxwell Davis and the two forged an innate working relationship the equal of any artist and producer in rock history, their abilities meshing perfectly with Davis’s saxophone work the perfect compliment to Milburn’s style. Milburn singlehandedly carried Aladdin’s rock reputation for years, scoring 19 hits, including four #1’s over his time with the company. His catalog ran the gamut from scorching party anthems to mournful laments and sublime songs of seduction making each varied approach seem completely natural and entirely effortless. In an ill-advised effort to capitalize on his early 50’s successes on songs with a drinking theme Aladdin began recycling lyrical ideas on a succession of releases to diminishing acclaim, thereby turning one of the most versatile artists of the era into a something of one-note performer just as rock was crossing over as a whole to an audience less receptive to that topic, crippling his ability to continue his run at the top. Upon leaving the label Milburn recorded – without the same success – for a variety of big name labels from Imperial to Motown, but despite some stellar performances his days as a hit-maker were over by the late 1950’s. After suffering a series of strokes in the 1970’s the World War Two vet lived on military benefits, losing a leg along the way, before passing away January 3, 1980 at the age of 52, silencing one of the top hundred rock artists ever.